Linux is so powerful and amazing. If that comes handy it is awesome, right? You can create a Live Linux bootable USB drive (Linux live USB) in just a few minutes. I just made one today by spending 30 minutes of time. I thought of sharing the process with you in this article. What is Linux live os? Linux live OS can be installed on a pen drive unlike on system hard disk and you can boot your PC / laptop from the USB drive by choosing the USB boot option from BIOS. Your system then loads the Linux OS from pen drive and you can start using Linux instantly without the need of instaling it on your system. What are the advantages of Linux Live OS? If your base OS is corrupted, you can’t access the data on your system. It may take time to repair it or reinstall it. You can just boot your system from the Linux USB drive and access your files, browse the internet, create office documents, what not! You can do everything instantly! You may want to learn Linux but you don’t want to install it on your PC since it is difficult and has the risk of messing up with base OS or you may have space constraint. You can just use live USB and get your work done. 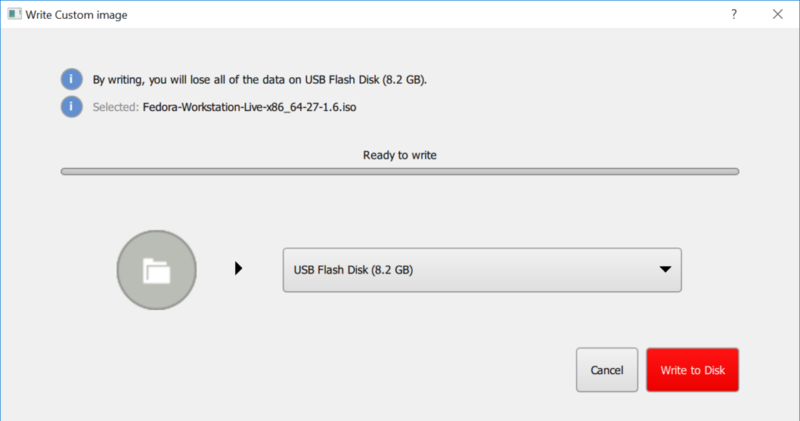 How to create bootable USB Linux (Linux live USB)? Amazingly it also comes with ntfs-3g package. With this, you can even mount your windows NTFS filesystems on Linux live OS . It’s cool, isn’t it? 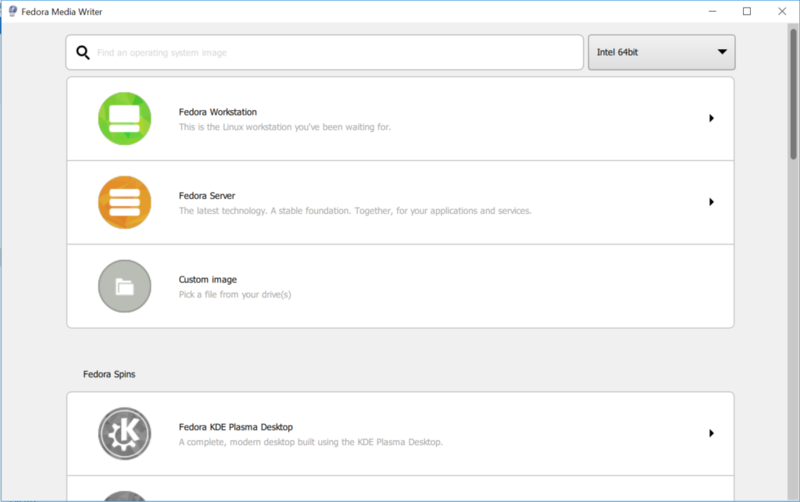 Download Fedora media writer from the below link. Installation is very simple, just double-click the binary and click the default options. 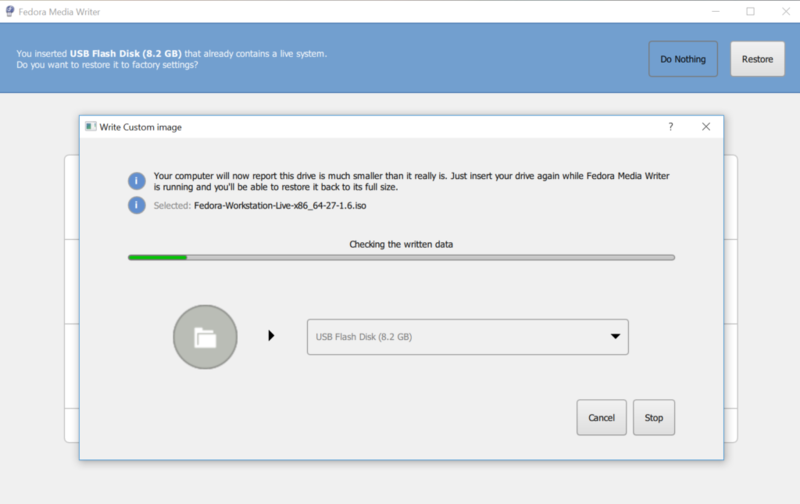 Now you have media writer installed, you now have to download Fedora Live Image. This is the ISO image which has live OS. Plugin USB drive to your laptop / PC. Make sure you have only one thumb drive to avoid confusion. You may end up deleting your useful data if you choose the wrong one. Open Fedora Media Writer from start menu. Click on “Custom Image” as shown in below picture. Choose the live image that you have downloaded recently from the “file select” pop up box. You will notice the progress as below. Once it completes writing disk (creating live fedora USB stick), It will verify the written data and you are ready to use it. Similarly, you can also create Linux live cd. My next article explains how to mount windows file systems on your live OS and few other options that you can try.